I know this category is for women. But let’s make one thing clear. No matter which gender uses a hybrid, many of us golfers want to kiss the person who invented the hybrid club. You see, we all sat there looking at our second shot. Way too long. We hit a fairway wood and we chance skulling the thing or wormburning it. We hit an iron, and we plunk it up and chance having to hit a third (or even fourth) shot. As men, we often would try to muscle lower irons when they were our only option, often to disastrous results. Ladies would be forced to hit a fairway wood almost every time. Callaway, Adams, Nickent, Orlimar, Bobby Jones, Nike, and of course TaylorMade jumped on the “hybrid bandwagon” and knew a good idea when they saw one. 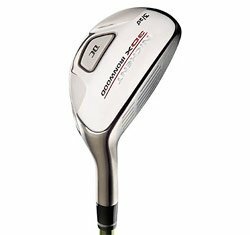 Some of them are sleek and clean like the Nickent Lady 3DX Ironwood Club, sleek and clean but with an incredible MOI and forgiveness like you wouldn’t believe. 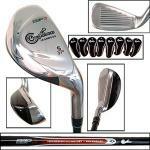 Some are more advanced than others like the Ladies Callaway FT-iZ Hybrid Club. The name itself is pretty advanced, but you can add a triangular head, aerodynamic head for less drag, and “variable face technology” to help with an even bigger sweet spot. If you have never hit a hybrid club, picture this. Your best 3 wood that you’ve ever swung. Remember that it picked right up off the ground and really moved toward the hole? Remember that? Me neither. But picture the distance of that mythical 3 wood shot, but done with something easier to swing like your 5 iron. Picture good loft, but with some umph. 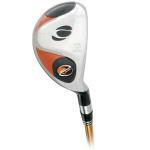 With these clubs’ better center of gravity and nice loft, you can really have the best of both worlds. Are you struggling to hit your irons? The name says it all here: the club was designed to replace those irons with this hybrid. Hybrids are the best things to happen to golfers picking up the game since the beer girl! I'm boycotting products that make women golfers better. Not because I'm sexist. Not because they get to play from closer tee boxes. Not because there aren't products out there designed for men.